After losing her parents at an early age, Naamah Carter discovers renewed meaning to her strong Christian beliefs through Joseph Smith’s testaments. His following in Peterborough, New Hampshire, flourishes, yet Naamah, her beloved Aunt Susan, and other believers suffer family strife and growing community resentment. She leaves her unfriendly situation and journeys to Nauvoo to be among thousands building their Prophet‘s revelation of an earthly Zion on a Mississippi River promontory. 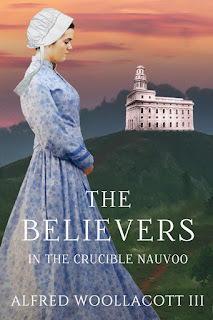 There, her faith is tested, enduring loss of loved ones and violence from those longing to destroy Nauvoo. With the western exodus imminent, she faces a decision that runs counter to her soul and all she holds sacred—whether to become Brigham Young’s plural wife. 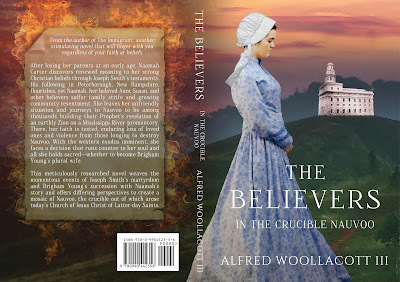 This meticulously researched novel weaves the momentous events of Joseph Smith’s martyrdom and Brigham Young’s succession with Naamah’s story and offers differing perspectives to create a mosaic of Nauvoo, the crucible out of which arose today’s Church of Jesus Christ of Latter-day Saints. The Believers is available now in ebook and print format on Amazon. Add it to your shelves on Goodreads, and visit Al's website for more information on his books and historical research.